Seeing a rabbit graze in your yard and slowly make its way through your landscape may be entertaining at first, but these small mammals can do considerable damage to your prized plants. 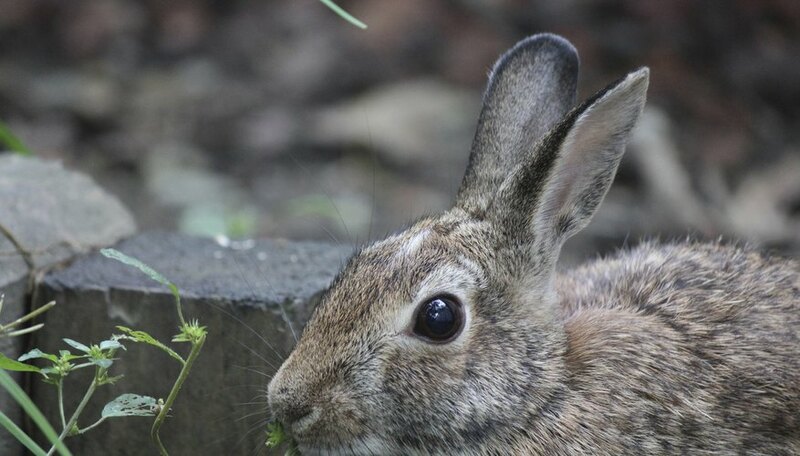 Few plants are safe from the grazing of rabbits, but some shrubs, ground covers and flowering perennials tend to stay untouched by these critters' sharp teeth. Note that when other food sources are extremely scarce, rabbits may feed on plants that are otherwise considered rabbit-proof. Ground covers can be used in large areas that other perennials wouldn't work in. These spreading plants grow low to the ground and provide a contrast to the lawn or other areas of your yard, but many also serve as a mouth-height, all-you-can-eat buffet for rabbits. In addition, many ground covers common in nurseries and garden centers are invasive in some areas. Carpet bugleweed (Ajuga reptans) grows in U.S. Department of Agriculture plant hardiness zones 4 through 9. This low-growing, purplish-blue-flowered perennial does well in full- to partial-shade locations. Plumbago (Ceratostigma plumbaginoides) grows in USDA zones 5 through 9 and handles full-sun to partial-shade locations. This selection also has blue flowers and grows to 1 foot tall. Several perennial plants are unattractive to rabbits, allowing you to add color and texture to your beds without the worry of foraging. To add colorful perennials in sun, consider daylilies (Hemerocallis spp.) or blanket flower (Gaillardia x grandiflora), both of which grow in USDA zones 3 through 10. Another choice is native columbine (Aquilegia canadensis), which grows in USDA zones 3 through 8 and can tolerate partial shade. For shadier spots in your yard where rabbits commonly visit, consider false spirea (Astilbe spp. ), which grows in zones 3 through 9. Astilbe boasts fernlike foliage and feathery plumes of white, pink or red blooms. Bleeding heart (Dicentra spp.) grows in USDA zones 3 through 10 depending on the species. The delicate, heart-shaped light- to dark-pink flowers droop from tender stalks. Shrubs play pivotal roles in many landscapes. Whether you need a hedge, accent or something to fill a bare spot, there is a shrub to suit your needs. Although rabbits often feed on the tender, low-hanging or growing shoots and buds of many shrubs, there are just as many choices for rabbit-proof shrubs. Several evergreen shrubs escape rabbits' radars, including boxwoods (Buxus spp.) and low-growing junipers (Juniperus spp. ), which are hardy in USDA zones 3 to 4 through 8 or 9 depending on species. Several flowering shrubs don't appear on the rabbits' menu, either, including the commonly planted lilac family (Syringa spp.). This fragrant group of shrubs varies greatly in size and shape. Purple, pink or white flowers appear in spring and offer an unmistakable fragrance. Lilacs grow in USDA zones 3 through 8 depending on species and cultivar. Bulbs are a perennial favorite for many gardeners as several species are harbingers of spring. Tulips (Tulipa spp. ), which grow in USDA zones 3 through 8, are particularly favored by rabbits. Better choices for rabbit-inhabited areas include daffodils (Narcissus spp.) and crocuses (Crocus spp. ), which grow in USDA zones 3 through 10 and 3 through 8, respectively. Nearly all culinary and strongly scented herbs turn off rabbits with few exceptions; basil (Ocimum basilicum), which is commonly grown as an annual, is an herb particularly favored by rabbits. University of Florida IFAS Extension: Narcissus spp.